Last week I visited the hospital-based lab of a colleague in the UK. One of the Haemophilus influenzae strains they're studying is resistant to killing by serum, and they wondered if our new genome-wide trait mapping project might be used to map the gene or genes responsible for this resistance. I've never thought about serum resistance before, and here's what I've now found out. In this context, 'serum' means 'blood serum', the component of blood that remains as a clear liquid after clotting has removed the cells (red blood cells and white cells and platelets) and the clotting-factor proteins. It retains all the small molecules (sugars, salts, etc. ), the lipids, all the antibodies and many other proteins. Body surfaces are typically tightly sealed to prevent surface bacteria from accessing the nutrient-rich tissues and the bloodstream. Nevertheless, bacteria frequently enter the bloodstream because a surface barrier is accidentally broken (e.g. by dental treatments and even just brushing your teeth), because local disease has weakened the surface (e.g. in pneumonia) and because certain bacteria produce proteins that actively damage the barrier. Various components of serum (and of blood) kill bacteria that enter the bloodstream. Foremost are probably the complement proteins, acting with or without the help of antibacterial antibodies. In general, bacteria that cause 'systemic disease' (disease that spreads through the bloodstream) are resistant to this killing; here's a review article from 1984. One major contributor to the serum resistance of these 'invasive' bacteria is the presence of a cell-surface capsule - a layer of polysaccharide that protects the cell from attack by complement. Most capsulated strains of H. influenzae are serum resistant, particularly the serotype b strains that cause meningitis, and nonencapsulated strains are typically sensitive to killing by serum. However the serum-resistant strain my colleague is interested in has no capsule, so its resistance must be due to some other property. Identifying the gene or genes responsible for this strain's resistance will be easier if the resistance phenotype is strong enough to be cleanly selected for. I've just searched for papers describing serum resistance in H. influenzae. A paper from Arnold Smith's group is encouraging. 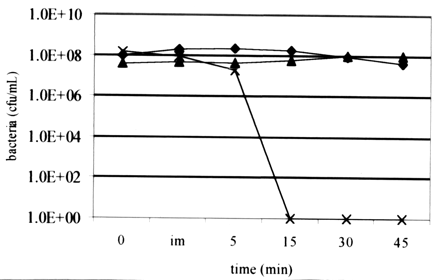 They were characterizing the complement resistance of a nonencapsulated but invasive strain R2866, and this graph shows the survival of it and control strains in normal human serum (diluted 50% in buffer+gelatin). The triangles are a typical encapsulated strain (Eagan); its viability is unchanged after 45 minutes in serum. 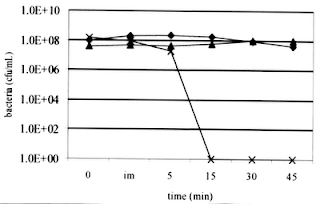 The Xs are the nonencapsulated lab strain Rd; none of its original 10^8 cells survive 15 minutes in serum. The squares are the strain R2866; it's as serum resistant as Eagan. If my colleague's strain is as serum resistant as R2866 we should have no trouble selecting for Rd transformants that have acquired the resistance. We might succeed even if the recombination is inefficient because the Rd genome doesn't have a homolog of the responsible gene or if more than one gene is needed to give full resistance.